If you have a thing for engines, then this Desktop V Twin Engine is the best way to keep it always on your mind while you’re at your desk. It’d be great for those that enjoy working on engines but are actually in an office job all day long. That or it would endlessly torture you by keeping your real love on your mind all day long while you’re doing tediously dull tasks. On the bright side it’ll give you something to play with on your lunch break. The fully functional engine runs on butane. When you have a full tank of it, the engine will run for about ten minutes. It’s as loud as a kitchen blender and is optimally balanced to keep the vibrations to a minimum. The German engine features two aluminum 1 ½ cc cylinders and stainless steel exhaust pipes. To get it started just fill it up with the required butane and turn the solid brass flywheel. An electrical impulse will then be sent to the two spark plugs that will in turn ignite the fuel within each cylinder. Since the engine is so exposed you’ll get to watch the movements of the valve rods, crosshead and crankshafts. You may want to keep this in a well ventilated room though, since despite that it does have a non-toxic exhaust it will still probably have a little bit of fumes. 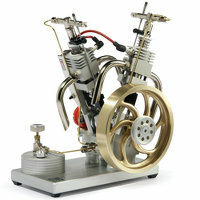 The engine is a bit pricey for those interested in it, it will cost you $1,000 through Hammacher Schlemmer. In this world of communication gadgets play a important role for a person to communicate with other person.